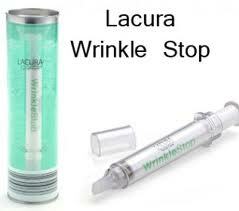 Lacura Wrinkle Stop is a highly effective form of facial care for minimising wrinkles in problem areas on and around the forehead, eyes, mouth and nose; it has been described as ‘the ultimate credit crunch cosmetic treatment’ by more! magazine. The patented active agent Syn-Ake, which mimics the effect of a protein found in snake venom, has been proved to help reduce wrinkles and smooth the skin. 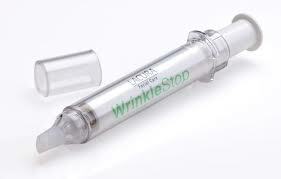 This oil free, anti-ageing cream called Wrinkle Stop contains a key active ingredient - Syn-Ake. Syn-Ake is a synthetic substance which mimics the effect of a protein found in the venom of the Temple Viper Snake. Amino acids found in the venom block nerve signals telling muscles to contract, which helps to stop wrinkles forming as well as smoothing out the skin, producing a wrinkle free appearance. It has been proven to help reduce forehead wrinkles by 53% and crow's feet by 24% after 28 days. At an amazingly low price of just £4.99 it's so worth trying out. I was kindly sent one to try by the lovely people over at Aldi and have been using it for over a week. Every Morning and Night I've been applying a thin layer of the Wrinkle Stop cream to my face. It smells great and feels very luxurious. It's non oily and not greasy at all. I wasn't sure what I'd make of it as I've never tried this sort of thing before.I used to have such great skin, never really suffered with dryness or spots when i was in my teens. Now at the ripe age of 29 my skin is worse than ever. It's so dry and UN-healthy looking I really need to start looking after it and doing something about it before it's too late. I found that every time I used it I felt a kind of tingling feeling in my skin, was very strange but I'm guessing that could be a good thing. Maybe it means that it's working. My skin now feels really soft and very smooth. Its making me feel nice and pampered. I've got myself into a nice little routine every day now and it's so quick and easy to use. The fab little syringe looking applicator is very clever. It has a nice little feature of a twist top that locks into place to stop it spilling of accidentally being pressed when not in use. I thought it was quite a clever little thing as it stops my kids wasting it if they get their hands on it. I'm not sure what the long term results will be like but I'm very happy to continue using it too find out. There's a fun little feature now on the Wrinklestop page too. 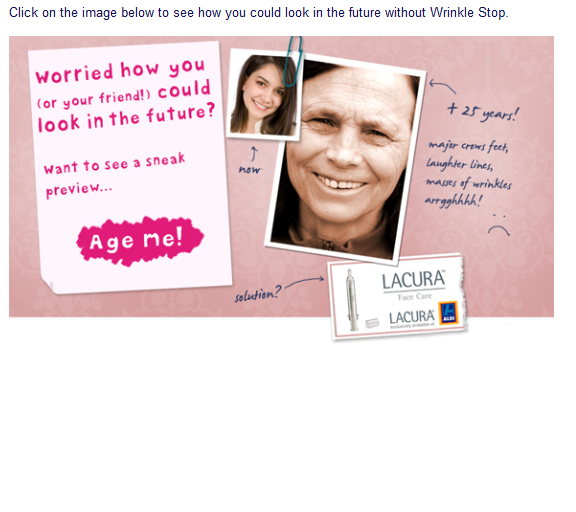 You enter a photo of you and see how you could look in 25 years time if you don't use Lacura Wrinkle Stop. Why not give it a go for fun and see what you might look like. So overall, I am very happy with Aldi's Lacura Wrinkle Stop and am very excited to see how it continues to improve my skin. It's well worth trying out I think. Do you use any Anti Aging products? I bet you pay a lot more for them though? If you're looking for a new one or an alternative or Even a first time choice then why not give it a go. Head on down to your local Aldi soon as stocks may run low at this fab low price and I wouldn't want you to miss out now would I.